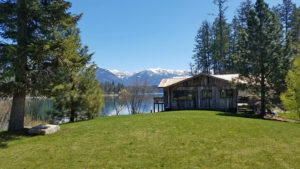 There are three navigable lakes that nestle the foothills of the Swan Mountain Range and are located east of Kalispell and near Bigfork, Montana. They are Lake Blaine, Echo Lake and Swan Lake. Waterfront real estate is sometimes scarce on these three lakes and usually there are only a handful of homes and land available at any one time . . . thus prices have tended to stay strong. Scroll down to see the current selection of homes on each of the lakes.